92-kHz / 24-bit sample rate), but there's also an interactive timeline packed with unseen video, photographs and lyric manuscripts from throughout his entire career. There's also the Times-Contrarian newspaper where Young and his team post regular news updates and respond to letters. The Neil Young Archives was initially free and anyone can still browse through it, but late last year he opened it up for paid subscribers ($ 1.99 a month / $ a year) that allows complete access to the site and exclusive early access to concert tickets for all of his shows. 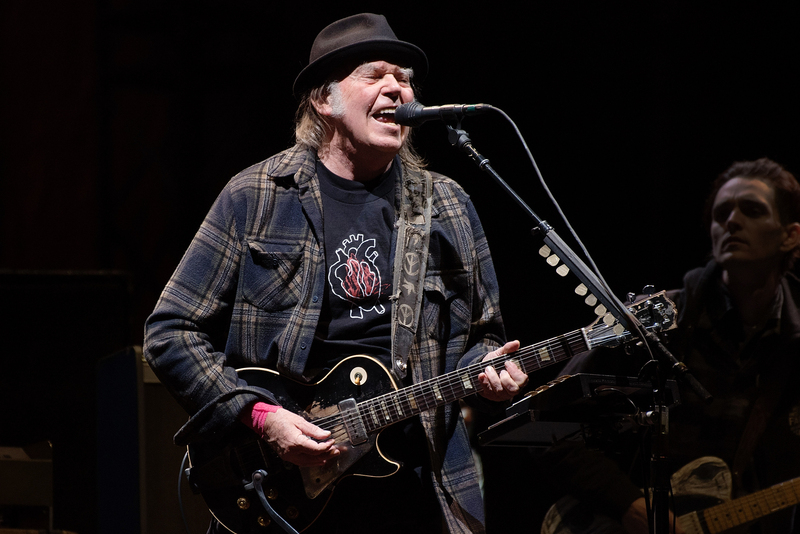 Subscribers can also watch livestreams of select concerts and watch vintage Neil Young movies in the Hearse Theater, including films like Muddy Track and Solo Trans that are practically impossible to find anywhere else. Young called up Rolling Stone while traveling to Minneapolis to play a series of solo acoustic dates to chat about the Archives, his recent theater shows, the next historic concert recording he plans to release, the upcoming Winnipeg gigs with Crazy Horse and what the future might hold for him. Let's start with the history of the Archives. What gave you the idea to turn it into an interactive website? We spent a lot of time developing the interface for the Blu-ray, but we couldn't use the internet until we developed the hi-res streaming aspect or it. That gave us open by where we could do what we wanted. I started making Archives when I was making Ragged Glory [in 1990]. We worked on it for a long time to get all this stuff together because we keep everything. We kept track of everything. It's just kid or something that I do. The technology just kept getting better and better. The future is just incredible for the sound of music. We've got 5G coming. But even without 5G, I've got it working. You can have high-resolution sound over the internet and people are going, "Well, this really sounds different! It sounds good! ”I get all these letters saying that. It's very gratifying after beating my head against the wall with Pono and trying to make everything happen and knowing that the sound could be better and having to put up with these big-nosed people and their blogs who have absolutely no idea what they're talking about. I was attacked by everybody for trying to make music sound better. It felt really great to be able to develop the technology now where you don't need anything special. You don't need a Blu-ray player. You don't need anything. I already did that, and then I put it back on. That's where people get music. I want people to hear music music matter what they have to get through to do it. I'm just trying to make it so they hear a lot more and enjoy it a lot more, but sell it for the same price because music is music. It's not as good as cost twice as much as the crap we list to now. It should cost the same amount. It should be a choice of the people. What do you want? If MP3s are great, keep the MP3. Fine. Do you ever get frustrated that most people don't care about the sound quality of their music and they are happy with Spotify or even YouTube? Not upset about people who don't seem to care because why would they care? Tell me. What would they be comparing to? They've never heard the other thing. That's the way I look at it. The people at the music services today have a responsibility to the arts. Apple has a responsibility to the world to make sure that all of the things that made Apple great are not just stomped on and forgotten like sound quality. These things are very important to the enjoyment of the art. It's like having a Picasso show and finding out they're all Xeroxes. That's what Spotify is. You can recognize that it's maybe the Picasso that you like, but then you're like, "OK, next." You're not solving it. You've got to feel the music. This whole thing is about feeling the music. That's what the technology is doing. That's what our technology does and what people are hearing. It's got to be the 21st century. You shouldn't have been worse than in the 20th century. Probably based on me just never wanting to give up. We're going to do everything we can to make quality available to people who want it. We have a lot of things in there. You've probably been around it, but it's not normal. You're really walking around a museum or an archive, and you're really walking around inside cabinets and seeing things and finding things and discovering the interrelationships of things. There are lyrics and videos that didn't get released. They were great things, but they were long enough to be released. It's the history around each one of the creations. It's the ambience of the times, of the music. It's a project and I really wanted to hear it. That's the real reason I'm still here. It's because I made songs that peopled liked hearing. I want to make it so today's artists can hear the way I have heard. There are some great singer-songwriters. There are great artists of all kinds, no matter what kind of music you like. They're all there. Great-sounding music sound is going to make it all possible to stretch out more and really live the dream and then give it to everybody. It's a no-brainer. If a hippie from the Sixties can find something that plays hi-res like a streaming service over your phone, and you can count on different between that and what you get at these other things, then why not do it? It's the 21st century. Look at all the other stuff we've done. You think we could do something like that. It would be nice. The entire world would be listening to better sound. In the Archives timeline I see placeholders for Chrome Dreams, Homegrown Boarding House Toast and a bunch of other unreleased albums. We are actively completing and going through the post-production stages of mastering several of those right now. Each one takes time, because it's a special thing, and we've taken real care to make sure that we've got our original tracks that were on the highest quality before we put it together. We've got all the artwork that was created for it back then. Our goal is to be able to make three or four of them a year because we have so many of them. We want to give each one its due. Will Archives II ever come out with a physical set or will be the whole thing digital? Archives II is just a regular set of CDs that you can listen to and will have a book with it that is very cool. It's got a lot of great pictures. It's a beautiful book. If you like owning your music and taking it with you on CD, it's good. I really, myself, like the files now. The files are not limited to the electronics of the CD player. You can play back the whole file, really hear what we heard in the studio. That's what I want. It's weird. The deluxe part of this thing used to be the Blu-ray, [and] we all know that box sets can be fantastic, but they're really a relic. They're from another time. Hello. Goodbye! This is what we're doing now. It's the highest res sound. It's got all of this interactive stuff. The timeline goes for 50 years. On the Blu-ray, you have to stop every 10 years or so and put in another disc. It was really primitive. This is much, much better. When you play our files streamed by NYA through Bluetooth in speakers, it is definitely sounding better than what you used to hearing with Bluetooth. The reason is that we're giving people the real file. We are not giving them any dummied down version that has five percent or 10 percent of what we originally made so that people can save space on their devices. We're giving you the whole thing because memory is not a problem. Streaming made that a non-issue. We're just going forward. You've just been playing a lot of concerts recently for your Archives subscribers. They're great. I'm on the road to the theater tour now. The theater tour is just a little twist on what I [normally] do. You just want to play the theaters and forget about the towns. It's great to be in town, but you can't… In Minneapolis there are four incredible theaters. So, I'm playing every one of them. I just go from one theater to the next. And these theaters are beautiful. They're the stars of the show. They're like, built in the Twenties and Thirties. These place are almost 100 years old. This is like history. These are palaces for art. This is a creation. It's vaudeville. It 's early movies. If you go to these places and share the experience with NYA, people who love the music and love the archives and love picking up this stuff, it's my way of giving them this. It's a gesture toward them for supporting me, in some cases, 50 years. I can’t help that 73. That's the way it rolls. I still like what I did and I wanted to do it better. I don't want to leave behind, "I didn't try to make it better." The art right now is being stifled by the technology. We are living with a blindness for technology when it comes to audio. It's a disgrace that a company as big as Apple would relegate their entire audience to this kind of quality like it was good. Do you think your days of going out and playing arenas and being on the road for months left over? I don't know anything. I just feel what I'm doing here. These tours are great for me. It's a moving target. Everything changes all the time. The only box I can put myself in if I say, "Well, I don't want to do that" or "I don't want to do that." I want to do whatever I feel like doing. Because I've got the songs, I can go out and rock and I can have a good time. If people want to hear me, they can come out and hear me. I like doing that big shows every once in a while, but if we're doing a big show we also do five or six supporting shows before. When we get there, we've been playing, we're on fire. We walk onstage, we're loose. That's what everyone deserves. Yeah. That'll be fun. I was just conversing with Ralph [Molina] about some of the songs that we're going to do, and I'm looking forward to it. There's nothing like being able to get together and play. Will Nils Lofgren be on guitar again? yeah. Nils played all over After the Gold Rush and he played all over those early albums that I did. It just gives me a whole wealth of material to draw from when I have the original players. No, I'm not. I really can put my finger on it. I'm writing songs and I've written some really interesting songs, I think, for me. I don't know where I'm going. I'm just going. Then when I arrive I sure will identify it, but you don't know where that is right now. What's the next Archives release? Is it Odeon / Budokan from the 1976 Crazy Horse tour? Tell me what it's like for you to write for the Times Contrarian as much as you are. I imagine you utilizing a lot of lessons you learned from your father. When I write for the newspaper I enjoy it because my dad was a newspaper man. We have a lot of freedom. We don't have deadlines. We don't have story counts. We check type, but we don't say you have a headline that's sensational. We try to do with what we have in the way of what's going on. We can write about anything we want and there is no pressure. What you write up in your column and it just stays there until you write something else. We're just doing it our way. Having a lot of fun doing it. And there's no filter now between you and your fans. You talk right to them and they talk right back to you. None at all. We have letters to the editor. They don't have to blog on somebody who has a grudge against somebody. It's old-fashioned. You write a letter and if the letter is stimulating to me, you answer it. Even if it doesn't and it's just someone saying something they care about, I'll put it in there and comment on it. Sometimes somebody gets under my skin and I talk to them about that, why I think they're missing something and why we're different. It's a good thing. It's a direct conversation with the people who love the music and are able to take part. Finally, they're doing a Woodstock 50 concert. I didn't know about that. Andy, you are on the cutting edge!